Millbridge Court is an elegant seven bedroom hotel and barn situated on the Surrey / Hampshire borders in the quaint rural village of Frensham. Easily accessible from Clapham Junction and Waterloo main line train stations, and close to Aldershot, Farnham, Farnborough and Guildford, it’s convenient location will be popular if accommodation for a large number of friends and family is required. The hotel itself combines a traditional feel with its brick and stone construction and a modern bright and airy architecture with crisp white walls which allow for individual expression for decorating a blank canvass to desired colour themes. 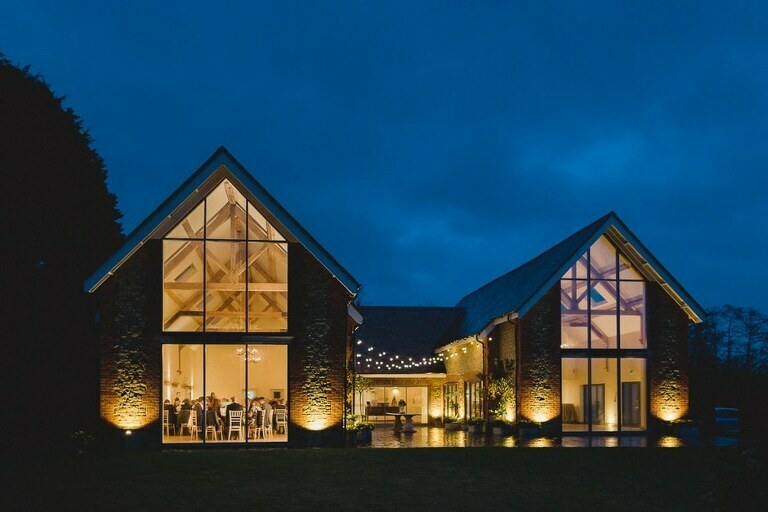 The barns and ceremony room feature floor to ceiling glazing which overlooks the stunning landscaped exterior lawns as well as beautiful views across the Surrey countryside. 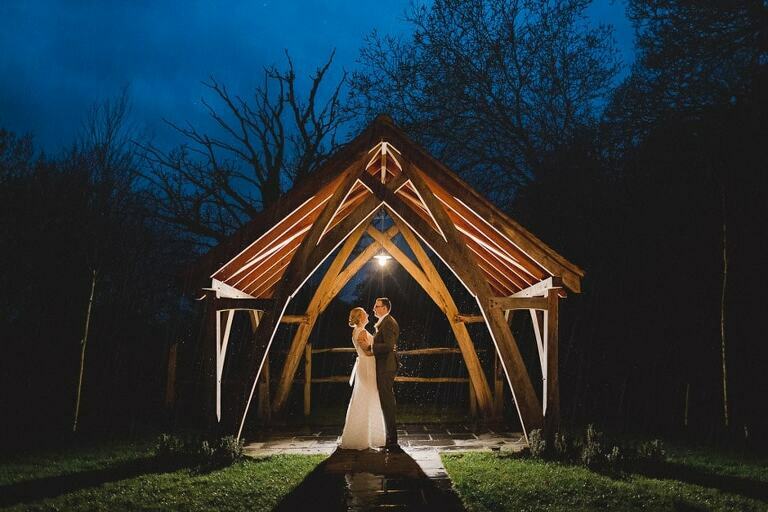 Contrasting with the modern interior, the hotel grounds also include an arbour, which is perfect for summer weddings and for those wishing to tie the knot outdoors. An attractive stone pathway leads to a romantic wooden frame and provides an extremely popular area to exchange wedding vows. The river, wildflower meadow and open countryside views offer exceptional opportunities to capture truly magnificent photographs and give it a traditional ‘English Country Garden’ atmosphere. Millbridge Court incorporates a Dining Barn, which accommodates 150 guests for a wedding breakfast, as well as the Ceremony Hall and bar which plays host to evening entertainment for 200. Specialist catering teams and a wedding manager are available to create individual wedding menus and to ensure all preparations run smoothly. The hotel also includes several reception rooms, lounges and areas of relaxation complete with sofas, lamps and a log burner. There is also private dressing room provision for the bride and bridesmaids complete with full length mirrors and five make-up stations complete with luxurious interior furnishings. A hallway links the ceremony halls to the main hotel accommodation. Refurbished in 2015 the seven ensuite bedrooms maintain a traditional rustic interior design. The combination of oak wood beans, beds and furnishings with modern soft furnishings in the form of pastel linens, throws and cushions, provides pleasant, cosy and intimate accommodation. All bedrooms are held available for a bridal booking, which is convenient for wider family, takes the worry out of looking for alternative accommodation and enables guests to fully enjoy the evening’s entertainment. With its stunning location, interior and exterior wedding facilities, honeymoon suite and guest accommodation, Millbridge Court is an example of one of Surrey’s leading wedding venues. It is bright, modern, extremely welcoming and provides the backdrop for spectacular wedding photographs. What more could you possibly need for your perfect wedding location? I’ve photographed lots of beautiful wedding venues in Surrey, so if Millbridge Court isn’t the venue for your special day, then why not have a look at what else the county has to offer. Address: Frensham Road, Farnham GU10 3DJ. If you’d like to enquire about my availability for Millbridge Court please get in touch here.